When it comes to delicious tacos, Chicago (yes, Chicago) is seriously underrated. The city might lack the selection of states closer to the border, but the tacos you can get your hands on are pretty darn delicious. From essential taquerias to trendy cantinas, these are the best tacos in Chicago. This little vendor at Maxwell Street Market is not only pressing fresh handmade corn tortillas to order, but also spit-grilling the al pastor as it truly ought to be. Rubi’s is busy nearly every minute during the eight hours a week that it operates (7am-3pm on Sundays), so be prepared to encounter a wait. Taco Joint is a trendy spot for Mexican street food and shots of tequila or mezcal. Grab a group and order a selection of tacos, making sure not to overlook the taco del dia (taco of the day). Service is fast but not sloppy, every salsa is made from scratch daily, and the meats yield a burst of savory juice with every bite. No frills at this laid-back neighborhood taqueira – just fresh tacos, packed to the max with grilled meat, onion and cilantro. 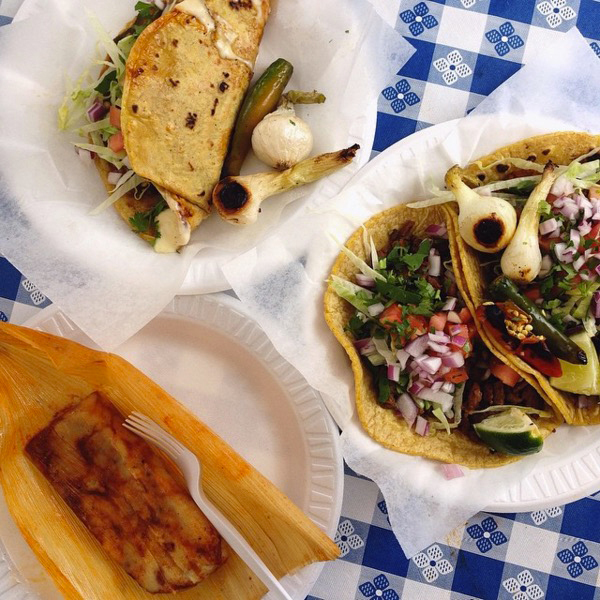 Conveniently located near the Blue Line stop at California Avenue, prices are low, service is quick and the tacos are on point – make sure at least one is carne asada. If you can overcome the sometimes-irritating, always-blaring country music, Big Star’s ridiculously comprehensive list of spirits and tasty tacos are worth the mandatory trip to the ATM. This cash-only joint by executive chef Paul Kahan is as popular for its taco de pescado and al pastor as it is for its rambunctious patio. The place gets crazy in the summer, so don’t be surprised if there’s a wait. It’s hard not to love this Wicker Park joint serving up its tasty rendition of Mexican favorites like grilled ribeye tacos and creamed elote. The space screams comfort to modern hipsters everywhere with rustic accents, touched-up antiques and bright pops of color. The pork carnitas taco, adorned with a thin strip of bacon, is quite possibly the best taco on their menu. This colorful taco joint in the Gold Coast neighborhood is the chain’s first location outside of Texas. And while the house-made corn tortillas could use a bit of work (they tend to fall apart mid-bite) the number of inventive tacos they boast makes up for that. You could lose yourself in the menu, so here’s what we recommend: spicy tikka chicken, annatto shredded pork, fried paneer and fish n’ chips. It might be fast casual, but it's definitely worth checking out. This tiny restaurant at the intersection of Ashland and Division offers a seemingly small, yet endlessly interchangeable menu of tacos, platillos, tostadas and quesadillas. Vegetable lovers will go crazy for the sweet potato al pastor, and those craving something meaty will love the classic carne asada. A nice feature of note is the colorful four-season patio out back. For a satisfying fusion of Korean BBQ and tacos, head to Del Seoul. Reasonably priced and undeniably unique, feast on the likes of spicy BBQ pork and kalbi (grilled beef short rib) tucked inside of white corn tortillas and topped with slightly overdressed slaw and a smattering of sesame seeds.